The ideal itinerary in Los Angeles looks different for everyone -- and that’s why exploring this place is so mind-blowing. The entire city is a vivid mosaic of beautiful people, places, and things in one place. Where else in the world can you horseback up an arid mountain, grub on burritos on the beach, catch an outdoor movie in a Hollywood cemetery, and top it off with jazz at a Prohibition-era speakeasy… all in 24 hours? Welcome to the laid-back, diverse LA lifestyle -- it’s whatever you want to make of it. With over 420 parks and 50 pristine beaches, LA loves itself some nature. Whether you’re an amateur surfer, avid hiker, or pro beach chiller, leaving city limits isn’t necessary. The secret to experiencing the Malibu Pier without enduring traffic? Get to the ‘bu before 10am. With plenty of SUP board rental shops, paddle out along the pier for morning entertainment while waving hello to world-class surfers and sometimes, even dolphins. Top off with a bite at Malibu Farm Cafe (hello, fried egg sandwich with crispy bacon). Get a dose of 1930s Hollywood at Will Rogers State Historic Park. Home to movie star and legitimate cowboy Will Rogers, the 186-acre park has miles of trails, so do as Rogers would by heading up to Inspiration Point via guided horseback for 360-degree views of the Pacific. You’ll never take a path here you didn’t like. For a walkabout you’ll talk about forever, challenge yourself by hiking behind The Hollywood Sign. Take the 6.5 mile Canyon Drive Trail in Griffith Park for a sighting of the actual Bat Cave entrance featured in the ’60s TV series, all leading up to a close-up of the 45-foot-tall letters. Yeah, it’s a touristy thing to do, but that doesn’t discount this as a piece of LA’s soul. Crashing waves. Palm trees. Ice cream shops. Skate parks. The West Side’s 22-mile beach boardwalk, The Strand, is the good kind of sensory overload, so let pure Los Angeles subsume your exercise. Beginning in Malibu and ending at Torrance Beach, it’s totally bikeable, but hit the boardwalk on roller skates for the most LA kind of workout. This gem in Playa Del Rey is illuminated at dusk. 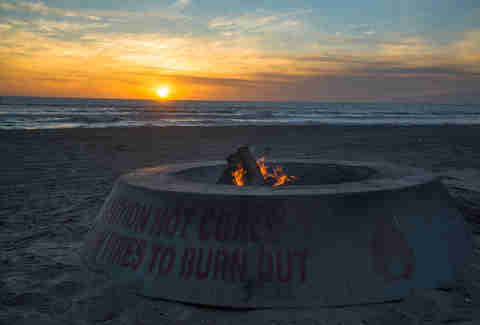 Over 40 fire pits dot one of the few beaches in the city that allows such things. Not to mention, grills are permitted, so a post-beach day BBQ is on the menu. Just be sure to get there early -- fire pits are on a first-come, first-served basis. LA’s urban sprawl has allowed neighborhoods to evolve into mini cultural hubs -- and hybrids. The result? LA cuisine is a foodie community that thrives on authenticity and is a total blessing to taste your way through. 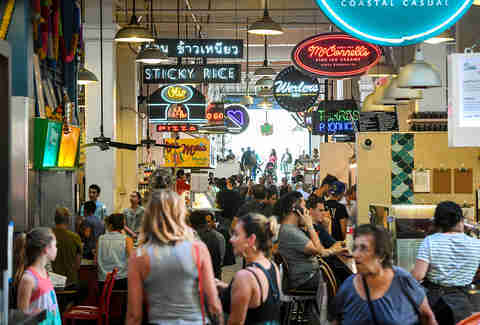 With over 25 food vendors, the hard part about ordering at Grand Central Market is narrowing it down among Jewish delis, Mexican candy shops, and breakfast sandwiches. Open since 1917, you’ll feel the history as you eat and drink counter-side at spots like the sustainable Oyster Gourmet and rightfully cultish EggSlut. There’s a reason Apple Pan hasn’t changed recipes like the Hickory Burger since the ’40s. Head here for the most all-American burger and apple pie combo you’ll try outside the midwest. Located on Pico Boulevard for the past 70 years, it’s even got kitschy decor and swivel bar stools that make it that much cooler. Everyone in LA has a go-to Mexican spot they claim is “the best,” but there are certainly unassailable classics around town. Enter: Tacos Baja. The spot is pretty bare bones, but the fish and shrimp tacos at this east LA dive bring in crowds of taco-obsessed people from all over -- especially on $1 Wednesdays. 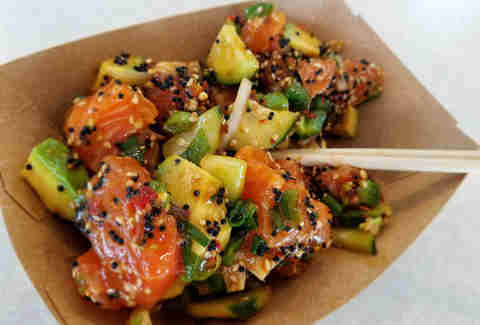 Poke-Poke is beloved by both locals and tourists who happen to stumble upon it on The Venice Boardwalk. Their OG poke bowl is a hit for a reason, but order the veggie poke bowl with kale and brown rice and top it with wasabi poke with avocado. Then proceed to walk ten feet to the beach and eat it next to a palm tree. Welcome to heaven. Late-night grub tastes better when there’s a speakeasy nearby. This is the case at Cole’s, downtown’s historic (110 years strong!) saloon beloved for its massive French dip sandwiches, spicy garlic tots, and bourbon pecan pie. 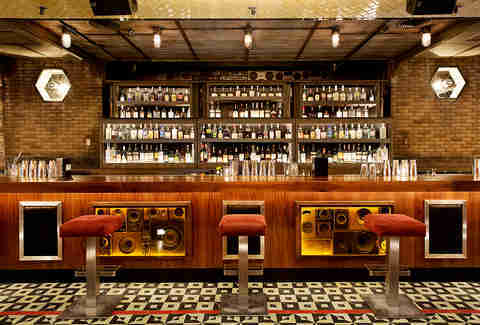 Totally up to you whether to sip drinks in between bites at the counter or enjoy a few post-meal behind the restaurant at Varnish, a Prohibition-era bar. It’s no surprise a city that has Hollywood offers world-class art, film, design, and entertainment. That’s why creatives flock to LA -- and why you shouldn’t totally write off the Hollywood scene. 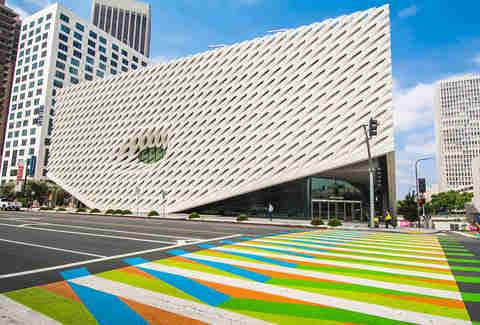 One of the hottest museum tickets in town (and a free ticket, might I add) is The Broad. With over 2,000 works of art, including interactive exhibits like Yayoi Kusama’s Instagram-famous infinity mirror rooms, even the 120,000-square-foot building itself is a masterpiece. Needless to say, reserve tickets in advance. The hometown love is deep for all of our teams, but the Galaxy has a particularly devoted fanbase. With games usually kicking off around dusk, die-hard LA Galaxy fans make an event out of it by tailgating. Plus, prolific goal scorer Zlatan Ibrahmoic has helped the Galaxy remain in the top 5 of their conference -- so get ready to celebrate a win. Exploring a replica of a 64-acre Roman country house steps away from the Pacific isn’t the worst way to spend an afternoon. 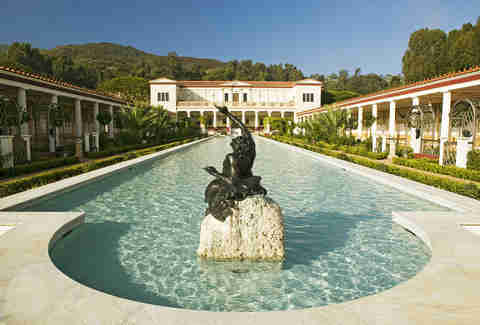 The Getty Villa features more than 44,000 ancient Greek, Roman, and Etruscan artifacts. There are also four gardens with over 300 types of Mediterranean fauna to leisurely peruse. Time to start living molto bene. The four-acre park above the Hills has a gallery, theater, art center, and the home that defined SoCal architecture. It’s true, a tour through Frank Lloyd Wright’s Hollyhock House will make you appreciate good design, but so will what happens after the tour’s done: wine tastings held every Friday on its manicured front lawn. Any film fanatic should close out an evening with an outdoor movie at Hollywood Forever Cemetery. Morphing into a giant picnic under the stars, it’s a surreal way to watch classics like The Outsiders, considering some of entertainment’s greatest, like Johnny Ramone and Jayne Mansfield, rest here. LA may not stay open into the wee hours of the night like NYC and Miami, but that’s just because the city does everything its own way. Work a few of these nightlife activities into any day or night out, and it won’t matter that closing time is 2am. 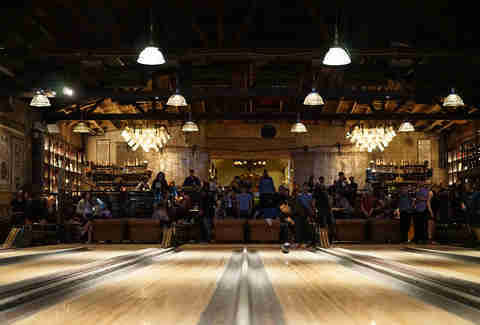 Highland Park Bowl’s wood-lined alleys are very much part of its vintage allure, but it’s also the live music that’s turned this refurbished space from 1927 into something one-of-a-kind. And with a menu offering a dozen types of Neapolitan-style pizzas, it’s both a solid brunch spot and post-dinner hangout. A day in LA isn’t complete without a rooftop excursion. Head to the top of the Freehand Hotel for its rooftop bar, Broken Shaker, to check this off the list. Before chilling next to the pool, head to the award-winning bar for a downtown-inspired menu with plates like crispy shrimp, potato tacos, and yuzo fried chicken. This ’80s-inspired karaoke joint is actually a secret bar with a hidden loading dock for an entrance. The strange journey there is worth it -- think classic arcade games, singing booths decked out with thrift shop finds, and a wall made out of cassette tapes waiting for you on the other side. It’s easy to photograph every part of the city, but for those with a desire to experience a unique walking tour in LA, a handful of sights will inspire any creator by foot. 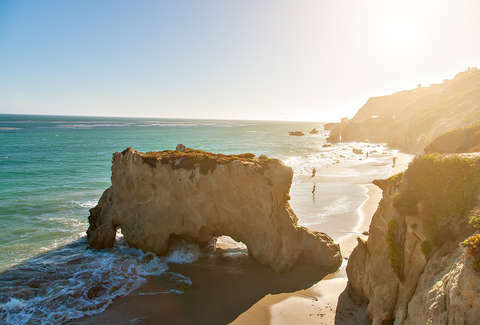 Welcome to one of the most visually pleasing beaches in SoCal. Not only do the dramatic sea rocks, cliffs, and vista points of El Matador Beach feel like a scene six hours north in Big Sur, morning sunrises while the fog rolls in could very well be a scene from Avatar. Whether it’s the beachside skatepark, the murals, or surfers at sunset -- Venice is a photographer’s dream. This includes the tropical gardens, pastel rowboats, and old-school bungalows that inhabit The Venice Canal District. It’s the most relaxed walking tour on the west side -- and a refreshing break from the same beach photos everyone else is taking. Both a bookstore and a record store, it’s selection of books live in an airy loft with dark-wooden staircases, archways made out of cascading novels, and 3D art made out of more books. Secret tunnels and passageways are also made with... more books. It’s just as magical as it sounds.